No company will work harder to earn your business and no company will work harder to keep your business over the long term. We treat you the way we want to be treated: fairly, honestly and respectfully. 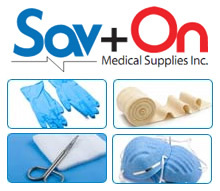 At Sav-On your business matters to us. We are simply asking for a chance to demonstrate our commitment. CAVACIDE SPRAY 2 FL OZ. You deserve a true partner in your medical supply program as you provide the physical, emotional and medical care your patients expect. Our commitment and dedication to this partnership is unwavering. Simply put… service and commitment is our business!